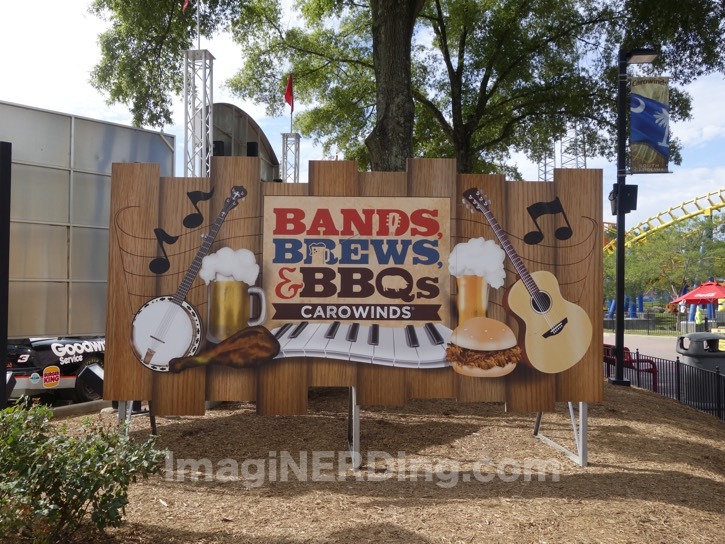 Carowinds Bands, Brews and BBQs festival is happening over the next few weekends (Friday, Saturday and Sunday) from 11am to 7pm until August 14, 2016. This is the second year for the food and beer festival and my first time attending. 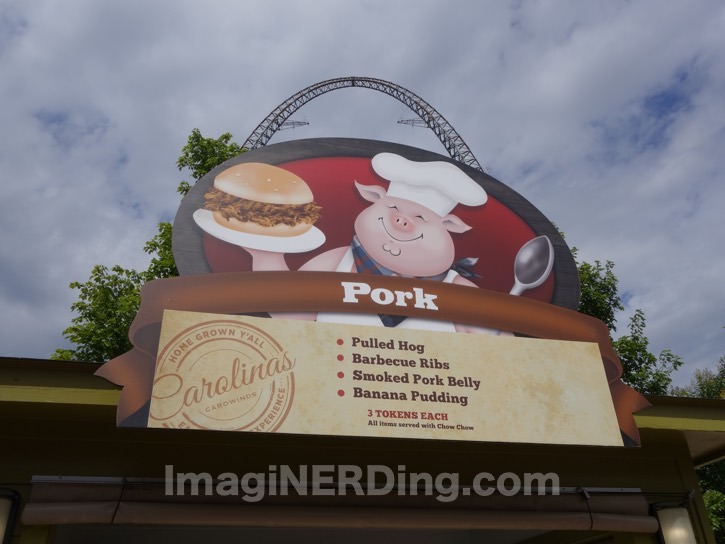 Carowinds has done an excellent job over the past few years with introducing special events, especially dealing with food. Check out my video review of the festival, which includes live reviews of some of the samples! 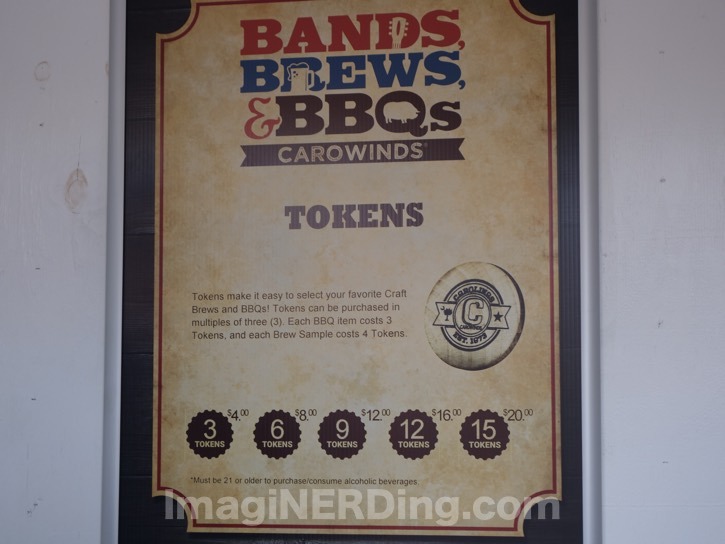 You purchase all of the samples with tokens, just like the Taste of the Carolinas and Brewfest events. 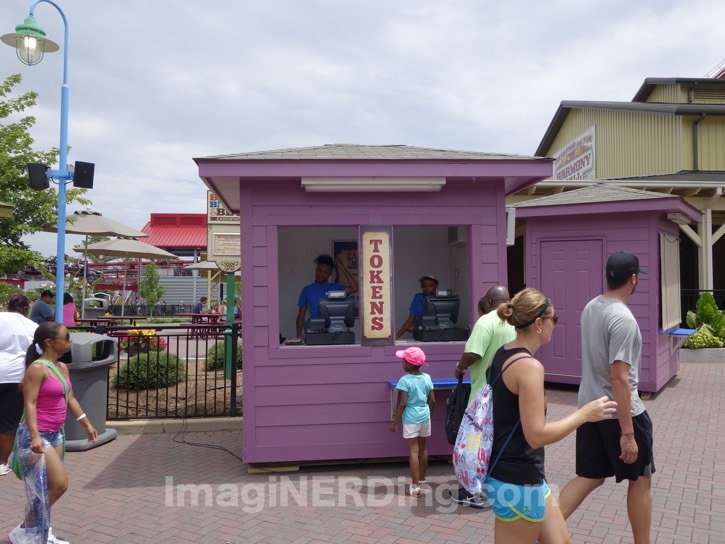 You purchase a group of tokens at a designated booth and use the tokens to pay for the sample or beer. It’s very convenient and makes it easier for the booths to handle the transaction. It breaks down to about $1.33 per token and a food sample costs $3.99 while beer is $5.32. The Beef Booth is the first one that you visit after purchasing your tokens. 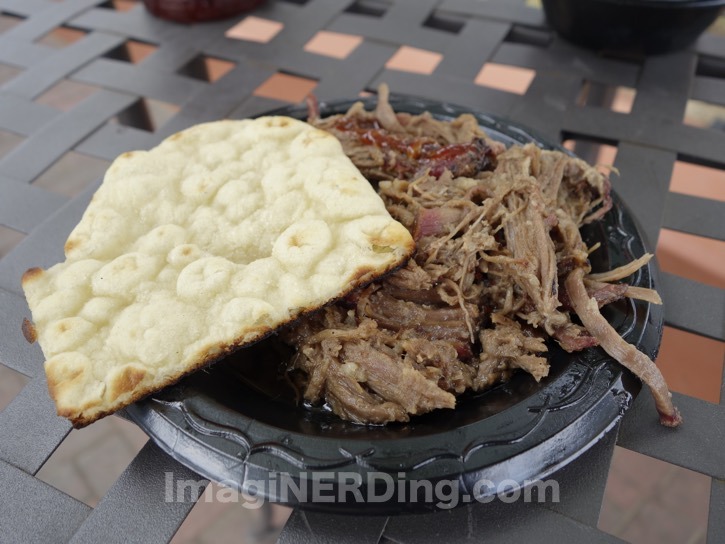 I sampled the Pulled Smoked Beef, first, and it was incredible. I love pulled pork and I was eager to try the pulled versions at each of the three different booths. I savored the tender and moist pulled smoked beef; it worked well with the sweet tea and manager’s sauce. The sweet tea set off against the smoked taste while the manager’s sauce, with the vinegar base, really amplified the taste. The bread was a welcome addition to sop up the juices and act as a buffer for the tongue, if the sauce was too spicy. Toasted with a jalapeno-maple spread, the bread was delicious! A serving of chow chow was included with each sample. Cho chow is a relish with chopped pickles and mustard. If you don’t find cole slaw at a BBQ restaurant, then you’ll find chow chow. It was a good side choice, since it went well with all of the selections. 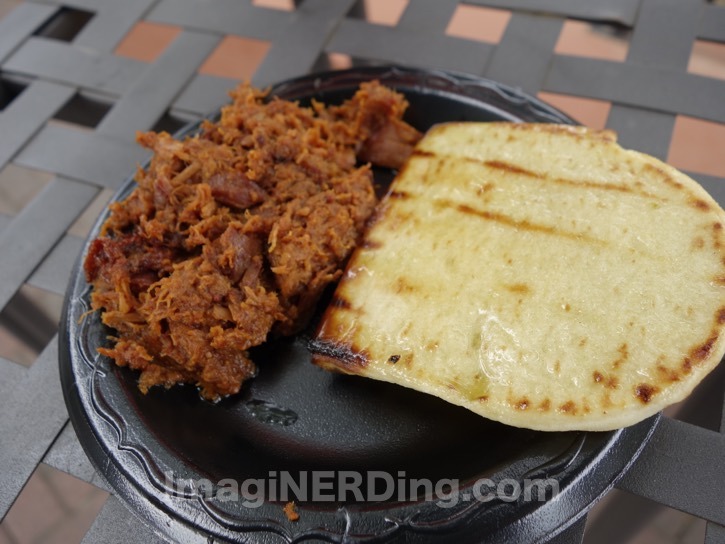 The Pork Booth offered my pulled pork and some other choices. The Pulled Hog was delicious! It has a peppery taste and was very moist without being mushy. I chose the Moonshine Mustard sauce with had a fantastic sweetness that wasn’t expected. The portions were large and it was easy to get two to three sauces on each sample. The Poultry Booth offered three different types of bird, and each one was prepared differently. I ordered the Pulled Chicken and sampled the Smoked Duck. The pulled chicken had a barbecue flavor, so I opted to not choose a sauce. It surprised me with the sweetness mixed with the smoky flavor. It was moist and held together well. The pulled chicken surprised me the most, since I was expecting a straightforward barbecue chicken flavor. I sampled the Smoked Duck and I was pleased with the warmth of the flavor. It was very supple and would have gone well with both a vinegar and sweet sauce. I waited until the end to get the banana pudding. Overall, it was a good choice for a dessert. Honestly, there’s not much else, besides chocolate cake, that would work well with barbecue. I’ve had better banana pudding, but it wasn’t the worst, by far. I know, that’s not a great review. 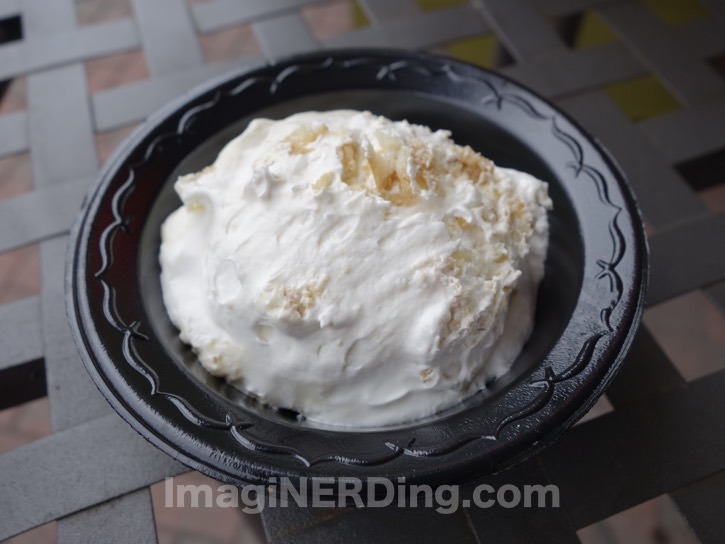 But compared to the other samples and the desserts from the Taste of the Carolinas Food Festival, the banana pudding just wasn’t spectacular. There were so many great sauces, that it made it hard to choose which ones to sample. I tried to pair a sweet sauce with a spicy or vinegar based one. Mainly to see how the flavors changed the sample. If you needed help choosing a sauce, all you had to do was ask! 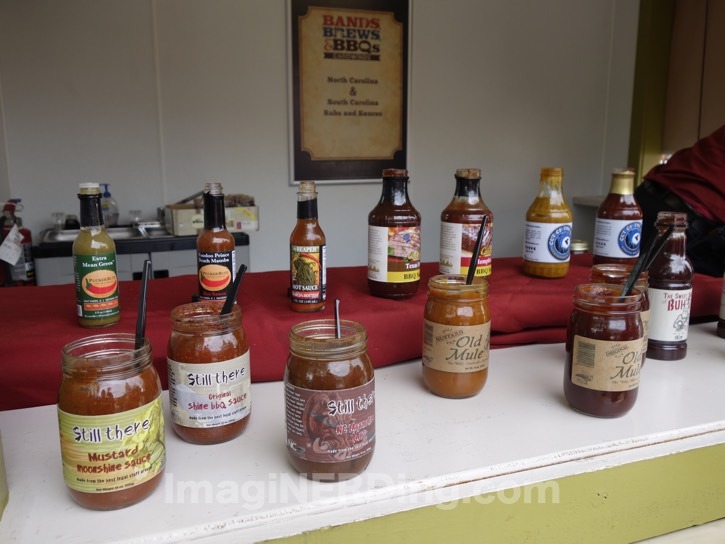 The employees quickly offered suggestions and advice with the sauces and rubs. The Sauces Booth was a the end, so to speak, and you did visit it for each sample. It was a nice touch to add some variety and offer some personalization. I even tried a sauce or two that I was unfamiliar with! 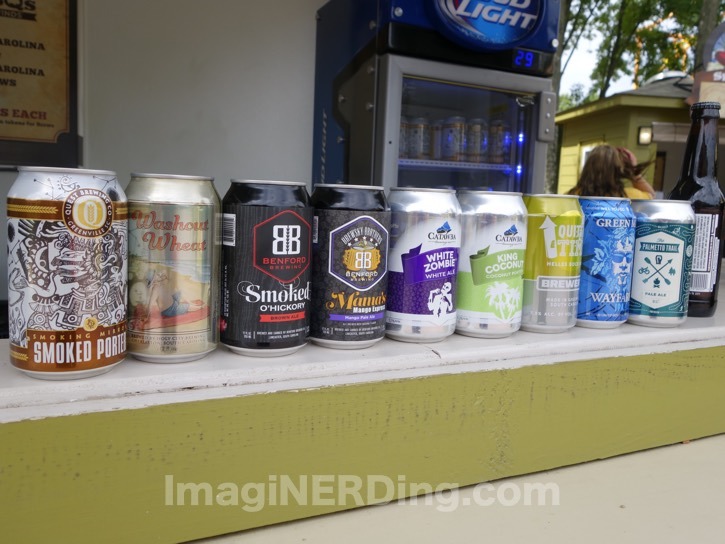 Sadly, I didn’t get to sample the beers, but there were some great choices, all from Carolina breweries. I spoke to other people and they were very happy with the choices and how well the beers went with the samples. The employees offered suggestions on the samples and they were very friendly. Undecided? Just ask for a small sample. Most of the ones I spoke to were culinary interns, meaning that they did have an interest in being there. Still, it was nice to see such friendly and smiling faces. 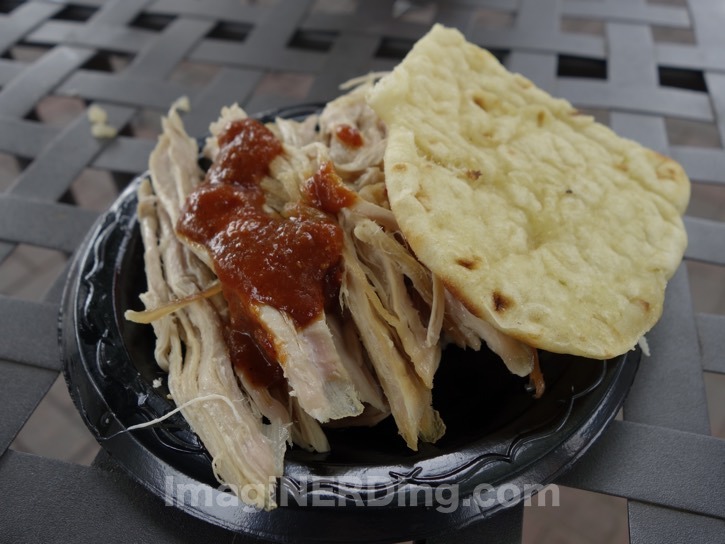 I loved that the food festival was smaller than the Taste of the Carolinas, which could be a little overwhelming. The sample choices at each booth made sense and offered a lot of variety. And at $4.00 a sample, you still could feel like you weren’t getting gouged. The samples were larger than expected, so I felt like I was getting a good value for my tokens. This is something that a couple or group of friends can enjoy without spending too much money. You could easily send $20.00 for the 15 tokens and get five samples. It’s a lot of food compared to a standard theme park meal. Kudos to Executive Chef Kris Suita for orchestrating another fantastic menu. 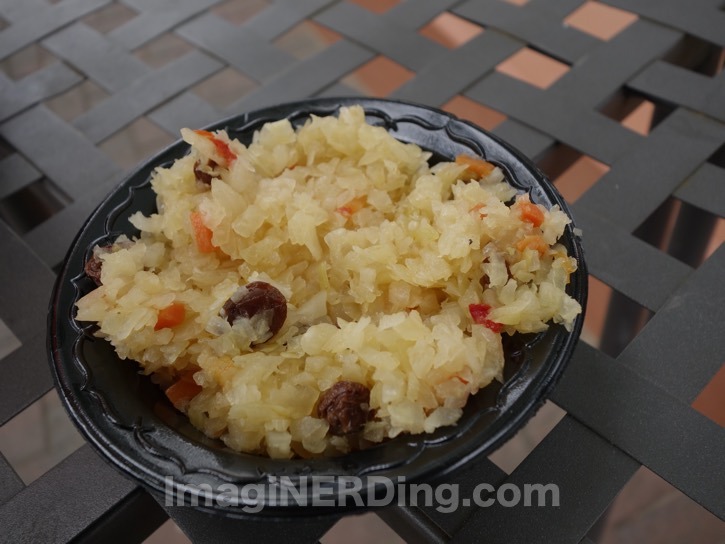 He’s managed to spice up the normal theme park food offerings, in general, and I can’t wait to see what Kris has up his sleeve (or under his toque) for future events. 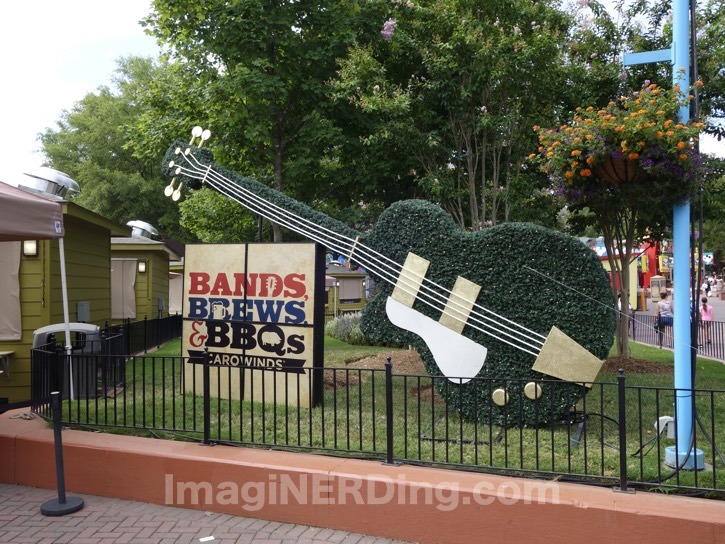 Are you going to visit the Carowinds Bands, Brews & BBQs Festival? Wow! 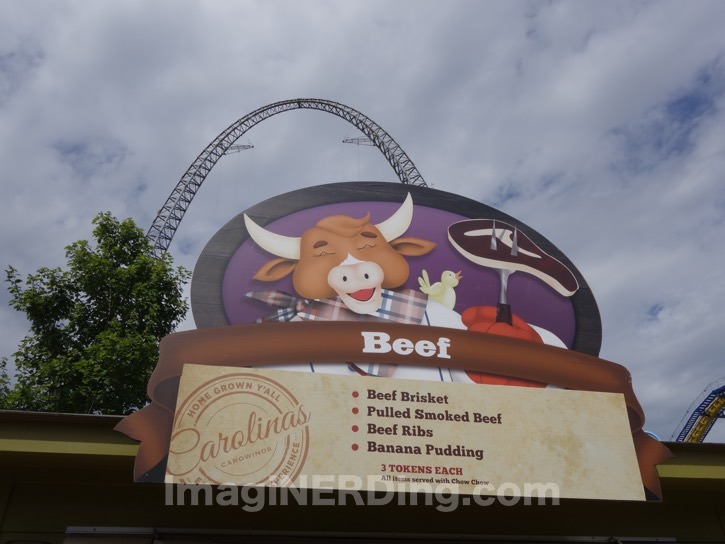 Love all your pics and this post on Carowinds. 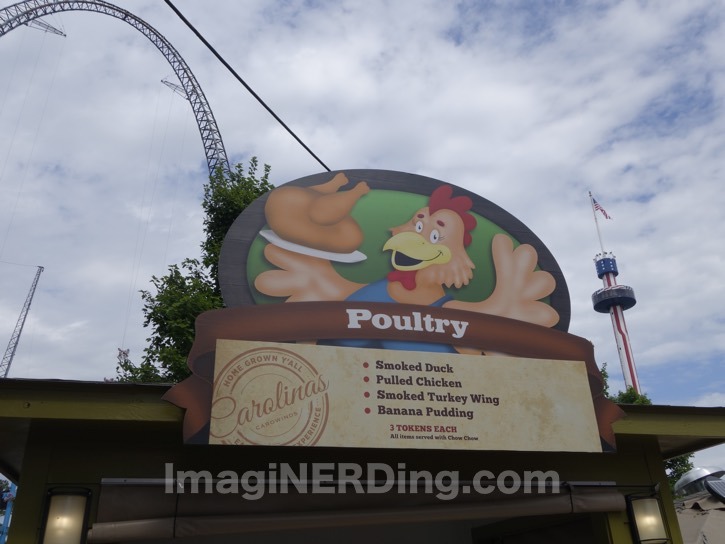 We also live in NC and have yet to visit Carowinds. Can’t wait now!.